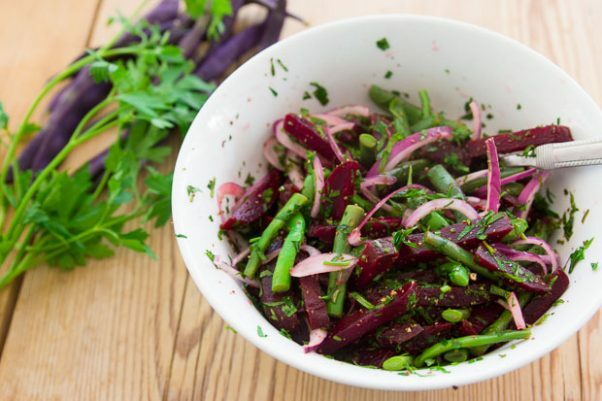 This beet and green bean salad is one of those salads that sets a table ablaze in color, making everything else you serve with it look better in the process. It’s also one of those salads that gets better with time, making it a perfect make-ahead dish for a summer potluck. By letting the beets and onions soak in the acidic dressing, the pigments in the beets and onions turn a more vibrant red. The green beans on the other hand will tend to discolor by soaking in the dressing, which is why it’s better to mix them in at the end. 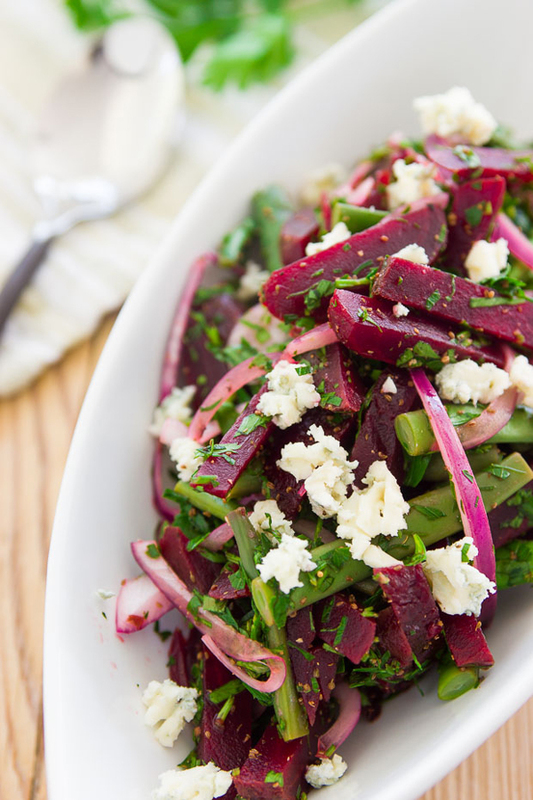 With tender, crunchy, crispy and creamy textures, the salad is as fun to eat as it is gorgeous, and the combination of celery seeds and flat-leaf parsley lends a marvelous herbal flavor that keeps it from being too heavy. While you can buy cooked beets at most grocery stores these days, if you can’t find them, just trim the stems off some raw beets, wrap them in aluminum foil and roast them in a 375 degree Fahrenheit oven until you can easily stick a fork through them (about 1 hour for a medium sized beet). 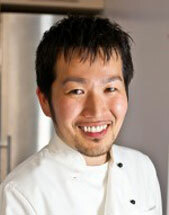 Then, let them cool enough to handle and you should be able to easily peel the skin off in strips from top to bottom. 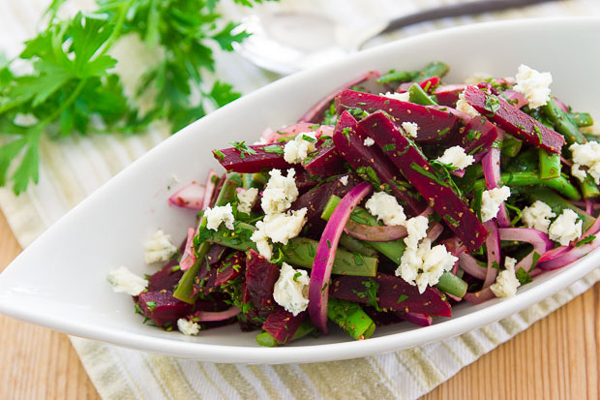 Create a tender, crunchy and creamy salad that's as colorful as it is tasty. Bring a large pot of water to a boil, and boil the green beans whole, until tender (1-2 minutes). Drain and plunge the beans in cold water to stop the cooking and set the color. Drain the beans well and trim and chop into bite-size pieces. Set aside. In a small bowl, whisk the apple cider vinegar, salt, celery seeds and black pepper together. 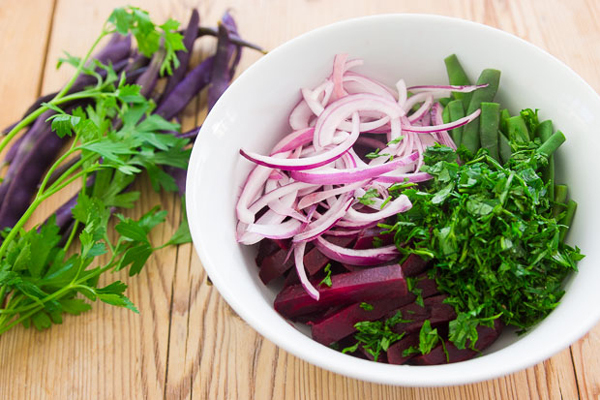 Add the beets, red onion and flat-leaf parsley to a bowl and toss with the dressing. If you are serving this right away you can add the green beans in as well. If you're making this ahead, store the green beans and the rest of the salad separately and combine just before serving. Plate the salad and crumble the Gorgonzola on top to serve.